Blood is often associated with life strength. No wonder, loosing blood any creature is exposed to the treat of immediate death! Why is blood so vitally important for any living creature? Medical men categorize blood as connective tissue. This precious liquid contains erythrocytes, leukocytes, and platelets which are also known as thrombocytes. The blood cells mentioned above are responsible for transport, immunity, and clotting functions. Our blood makes up about 8% of an average adult’s body weight that is about 5 liters. Arterial blood departs from the heart carrying oxygen with the help of erythrocytes, that is why it is bright red. Venous blood on its way back to the heart has less oxygen and is darker in color. Blood is 4 or 5 thicker than water. Blood temperatures within the body are about 100.4 degrees Fahrenheit, or 38 degrees Celsius. Blood is segregated into two basic divisions - the cellular components and the plasma. About 45% of the total blood volume of the human body is made up the cellular elements. The major elements of blood are the red blood cells, the white blood cells and the platelets, i.e the erythrocytes, the leukocytes, and the thrombocytes. The red blood cells outnumber other cells. A cubic millimeter of blood contains 4.3-5.8 million erythrocytes. To compare the figures, a cubic milliliter of blood contains 5,000 - 10,000 white blood cells and 250,000 - 450,000 platelets only. Erythrocytes are special biconcave disks. This shape is designed for the diffusion of gas. Erythrocytes live for approximately 120 days, that is why our body keeps producing young red blood cells. Leukocytes are white blood cells that help fight off infection and illness. White blood cells are larger than red cells and can move independently in an amebic fashion. When the body creates additional white blood cells, it runs a fever. White cells are completely transparent and can be watched in the microscope by staining only. Platelets are the smallest blood cells. Some scientists consider them to be forming elements instead of cells. There are about 250,000 - 450,000 platelets in one cubic millimeter of blood. The platelets are the only blood cells lacking nuclei and they are able to move on their own just like leukocytes do. As a rule platelets survive in the blood for 5 - 9 days. In is important to notice that platelets are vital to the blood clotting process. This phenomenon helps human organism prevent excessive blood loss in case of injury. When the string of platelets join together a certain amount of serotonin is released into the blood stream to restrict the flow of blood through the blood vessels. Hemopoiesis is a vitally important process of creating of new blood cells. 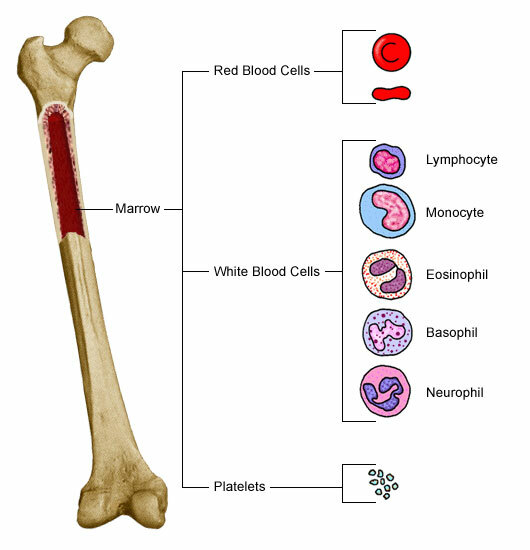 Bone marrow located in bones of the skull, the humeri, ribs, femora, pelvis, and sternum is responsible for forming platelets, erythrocytes, and granular leukocytes. Agranular leukocytes are created in the spleen, lymph nodes, tonsils and thymus. As soon as the blood cell life comes to an end, the liver and the spleen destroy them. It is wrong to believe that modern science has revealed every secret of the blood. Until now many aspects of this vital fluid remain a complete mystery.